Daikanyama’a T-Site is home to one of Tokyo’s best bookstores, Tsutaya, and to a cozy restaurant, Ivy Place. Ivy Place opens at 7:00 a.m., the same time the bookstore opens, which is just next door. The frittata had a touch of Japan with shiitake and maitake mushrooms with spinach, mozzarella, and feta cheese served with a salad (1,300 JPY). The NY rye bread comes with whipped butter and house-made jam. Blueberry and smoked nuts were the jams that day. The smoked nuts jam is creamy and sweet with a hint of smokiness to it (400 JPY). Best of all, Ivy Place offers a bottomless cup of coffee for 300 JPY with any breakfast menu. While I am not a vegetarian, I love that Ivy Place is a vegetarian-friendly restaurant with many options for non-meat eaters. The interior is like a warm American home with lots of wood and floor to ceiling windows surrounding the shop. Staff and the menu are bilingual. I am addicted to the flatbread pizza at lunch. This book includes the contributions of many star chefs, including Takashi Tamura (of Tsukiji Tamura), Eiichi Takahashi (Hyotei), Kunio Tokuoka (Kyoto Kitcho) and Yoshihiro Murata (Kikunoi). 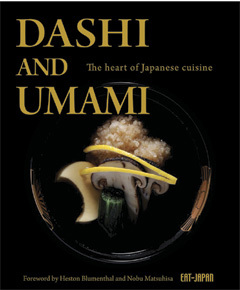 Photos of their kaiseki cuisine make this a handsome coffee table book, and students of Japanese cuisine will be impressed with the depth of information on umami-rich ingredients like kombu, katsuobushi, niboshi, and shiitake, all of which are essential in making dashi. Even water around the world is ranked from soft to hard—a hot topic for kaiseki chefs who have traveled the globe. Umami has been covered in many other books, and not always well, but this work captures the essence and explains it without missing any details. The tutorials on dashi may change the way you make this staple at home. The end of the book includes simple home recipes that are easy to incorporate into your repertoire. Finally—a book on nabe in English. Chef Tadashi Ono of Matsuri restaurant in New York and journalist-blogger Harris Salat of the Japanese Food Report have teamed up for the definitive guide to Japan’s quintessential comfort food. The first chapter deconstructs the basic parts of a good nabe: broth and dashi; foundational ingredients like Napa cabbage,daikon, Japanese mushrooms and tofu; seasonings such as miso; and yakumi (condiments) like ponzu and yuzu kosho. There are helpful suggestions on how to incorporate shime, the rice or noodles added to the hotpot as the traditional end of the meal. Recipes include classics like mizutaki (chicken and vegetables), yudofu (tofu) and the sumo wrestler’s staple,chanko nabe. Readers in Japan who want to try the book’s regional dishes are fortunate to have access to esoteric ingredients like ishiri fish sauce from the Noto peninsula or the grilled rice “logs” of Akita (kiritampo).Japanese Hot Pots is so easy to follow that you may soon find nabe becoming a regular part of your repertoire. And vegetarians, don’t despair—there are plenty of meatless recipes to keep you well fed through the winter. Takahashi Yagihashi has been a chef and restaurateur in the American Midwest for two decades. In 2000, he was named one of America’s Ten Best New Chefs by the prestigious Food & Wine magazine, and in addition to his namesake restaurant in Chicago, he’s been collaborating with Macy’s department store on a nationwide chain of noodle shops. This book is packed with recipes for common noodles like ramen, soba, udon and somen, as well as pasta and other Asian varieties. There are also popular appetizers often found at izakaya, like gyoza, yakitori, braised pork belly (which can also be used in ramen dishes) and shumai. Yagihashi has covered all the noodle bases, including a thorough collection of ramen dishes: chilled, tantan-men, miso and even tsukemen (noodles served separate from the broth). There are cold somen dipping sauces like shiso-ume, yuzu and tomato, plus dishes like curry udon and hearty duck Namban soba that will keep you warm throughout the winter. The pasta recipes include that Japanese standby, spaghetti with spicymentaiko; another, based on onsen tamago (soft-boiled egg), is Yagihashi’s twist on classic carbonara. First published in English 30 years ago, this little green tome by Masanobu Fukuoka has been reissued by The New York Review of Books as part of its Classics series. And the timing couldn’t be better—as issues of sustainability, agribusinesses and the use of chemical fertilizers have come to the fore, the book is more relevant than ever. Fukuoka (1913-2008) was a farmer who employed radical methods to grow his crops, like cultivating rice in dry fields and not weeding by tillage. (The title comes from his innovative system of spreading straw in gardens.) This compact work puts forth his opinions and chronicles the success he enjoyed with these and other practices. There are also interesting and informative mandala-like diagrams showing seasonal Japanese produce and seafood. Anyone who supports the Slow Food movement, enjoys working in a garden, or is concerned with sustainability will treasure The One-Straw Revolution—and most likely share it with many friends. Fukuoka’s book beautifully conveys his belief in eating healthful, natural food, and in doing so reminds us that an egg should taste like an egg. This new work by the doyenne of Japanese cookbook authors will be welcomed by everyone who loves washoku. Everyday Harumi is filled with easy-to-cook, home-style recipes that cover a wide range of meat, seafood and vegetable dishes. The book opens with an entire chapter on cupboard essentials for making Japanese cuisine, in particular sauces that you will go back to often: ponzu, men-tsuyu, and vinegar with mirin. Among the basic recipes are chicken karaage, shoga-yaki(ginger pork) and classic vegetable dishes like tofu salad with sesame dressing. Kurihara has also adapted a few recipes so that they’re easier to prepare with ingredients found in the Western kitchen—watercress, celery and cauliflower. There’s even an udon dish with a ground-meat miso sauce that could be mistaken for pasta bolognese. Even if you’re a collector of Japanese cookbooks, you’ll be pleasantly surprised by the new recipes to be discovered in Everyday Harumi. Bonus: the food is presented in lovely Japanese pottery and other traditional vessels. There’s relatively little information on sake printed in English, so whenever a new work on nihonshu comes out, it’s worth carefully perusing. 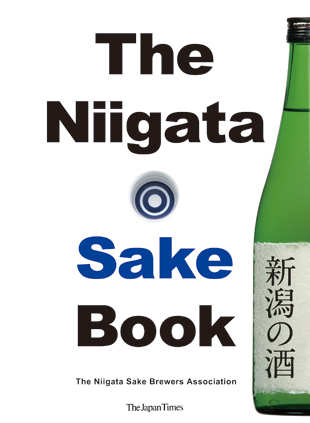 The Niigata Sake Book does not disappoint, especially for readers wanting to know more about the technical side of sake. It’s based on a work called The Niigata Sake Expert Textbook and, according to translator Mike Masuyama, is “the first sake book written in Japanese to be translated into English.” With its cool temperatures, rich water sources and highly esteemed rice, Niigata is an ideal location for making top-quality sake. This book is geared towards those looking for more scientific and technical information, including details about the brewing process, how to read labels, and what the differences are between rice strains. It’s suitable even for the beginner, though, with an opening section that’s filled with color photos and simple tasting notes. Masuyama deftly guides readers through the nuances of sake, offering insightful tips on flavor profiles that will empower anyone to become knowledgeable. This book is destined to become a reference guide—not only for Niigata sake, but for sake in general. 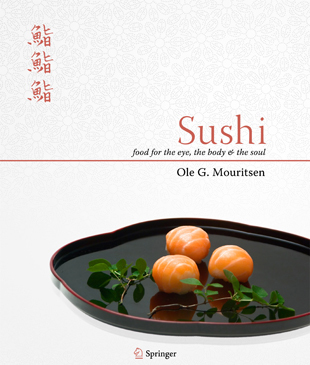 A professor of biophysics at the University of Southern Denmark, Ole G. Mouritsen has penned the most extensive and authoritative book—dare I say encyclopedia?—on sushi to date. This weighty tome is packed with more information than most readers will ever need. Yet that’s exactly where it shines. The author’s curiosity and passion about fish is evident throughout. Perhaps most notable is that, unlike other sushi books written by non-Japanese, the information about seafood is factually correct. Sushi will educate readers on all aspects of fish—texture, taste and how they are served. Packed with photos and illustrations (by the author’s son), this comprehensive guide also includes information on other dishes at the sushi counter, from the rice and vinegar used to make theshari to the green tea that ends the meal. With an extensive glossary and a rich bibliography, Sushi will find its way onto the bookshelves of chefs and foodies the world over. After consuming this work, readers themselves should be given a PhD in sushi. 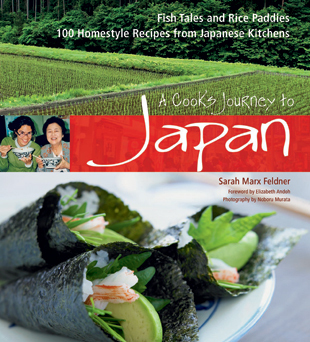 Sarah Marx Feldner takes readers on a trip through Japan with homestyle recipes from around the country. Her cookbook opens up with an informative guide to Japanese kitchen utensils, ingredients and basic cooking techniques. Filled with step-by-step photos to help novices master essential skills, A Cook’s Journey to Japan will give readers the courage to try new recipes. Classic dishes include tori karaage (Japanese-style fried chicken), age-dashi dofu (deep-fried tofu), and tonjiru (pork miso soup). But it’s the nontraditional recipes that really catch the eye, like Japanese “cocktail peanuts” (nuts baked in a sweet miso coating), ginger-fried soybeans and daikon salad with a spicy karashi-mentaiko dressing. There is even a dessert chapter that will have you craving matcha ice cream with brown-sugar syrup or Kagoshima shiro-kuma (shaved ice with condensed milk and fruit). The food styling is extremely appealing, with most recipes having their own separate photo. A Cook’s Journey to Japan gathers some of the country’s best recipes, and will be a treat for anyone looking to expand their repertoire of Japanese cuisine. Japanese Cocktails is filled to the brim with original concoctions with fun names like Oyaji, Salty Hachiko Dog, Bloody Mari-chan and Office Lady. And not only are the names creative, so are the recipes. 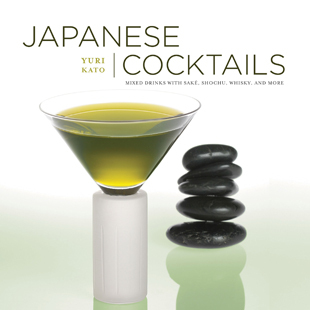 With drinks based on sake, shochu, whisky and more, this thin book has a cocktail to please everyone, many of the recipes are easy even for the inexperienced mixologist. The Hinomaru is umeboshi in warm sake, while the Samurai Courage combines yuzu juice with hotdaiginjo. Japanese Cocktails was written with the support of Suntory, so it includes some recipes based on the beverage giant’s lineup of whisky, Midori melon liqueur, and Kuromaru sweet-potato shochu. But in no way does this detract from the appeal. Author Yuri Kato, a “beverage alcohol consultant,” consistently offers offbeat and appealing drinks. Mixers include chestnut puree, aloe vera juice, steamed milk and even ice cream, while traditional Japanese ingredients range from citrus juices like kabosu and yuzu tomatcha powder and hojicha tea. Kato’s expertise shines in her explanations of shochu and Japanese whisky, in particular on how to properly prepare a mizuwari(diluting with water). If you enjoy mixing your own drinks, or even if you just want to get started, this fun book will be an excellent guide. This review first appeared in Metropolis magazine.